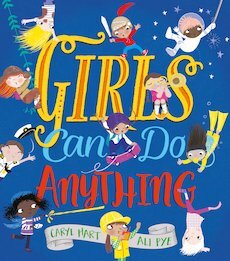 In celebration of the publication of Girls Can Do Anything on 2nd August, award-winning author Caryl Hart discusses the lives and achievements of five women who have inspired her. Rescuing people when danger is near. But is it true? 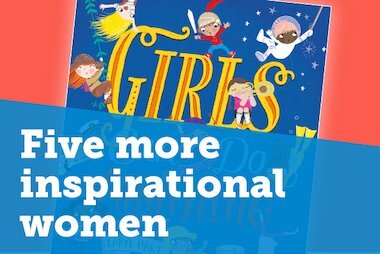 I wanted to not only tell children that anything is possible, I wanted to prove it to them, which is why we created a gallery of inspirational women on the back end papers of the book. One of these is Josephine Reynolds, who is a firefighter. In fact, she was Britain’s very first female firefighter, and made history when she joined the service way back in 1982 when she was just seventeen. Since then, many services have worked to recruit more women, but according to the UK Government Fire and Rescue Service Equality and Diversity Strategy 2008-2018, only 3.1% of firefighters in the UK today are female. Still, they ARE out there, so if your child is interested in joining the fire service – or any other rescue service for that matter – they can! And in remembering to use the non-sexist terms for these brave women and men, we are further demonstrating to our children that these careers are open to everyone, regardless of gender. For a fun list of non-sexist terminology, check out this page. It’s amazing what you find when you’re researching online. The Girls Can Do Anything gallery of inspirational women would not be complete without a portrait of this incredible young woman. Malala Yuousafzai captured the attention of the world when she came to the UK for medical care following an assassination attempt in Pakistan when she was just 15 years old. This was no random shooting. Malala had been speaking out about life under Taliban rule since she was eleven years old. She wrote a blog under a pseudonym and was featured a New York Times documentary in 2010. She gave interviews and speeches in print and on television and was nominated for the International Children’s Peace Prize. She was shot in the head, alongside two other girls, while on a school bus. Amazingly, she survived and was brought to the UK for further treatment following life-saving surgery in Peshawar. Since then, she has continued to speak out about the right to education and is the youngest person to be awarded the Nobel Peace Prize in 2014, aged just 17. Malala Yuousafzai is probably one of the most iconic young people of our time. Her courage and determination to make a difference provide an outstanding example of the potential that every single one of us holds within us, to make positive changes to our world. I was never all that good at history. The school curriculum in the late 70s and early 80s left a great deal to be desired, being mostly either about the first and second world wars, or medieval medicine – a course of leeches anyone? If you are a teenager, or parent of teens, you won’t be surprised to learn that these are still hot topics on the whiteboards of today’s GCSE students. However, as an adult I’ve discovered a new approach to learning about history and politics – through the words of contemporary modern authors from around the world. I’ve learned about the Chinese Cultural Revolution and the troubles in Pakistan and Afghanistan through reading novels like Half a Yellow Sun, by Chimamanda Adichie, which are about real people living through these historical times. They may be fiction, but they are based on a deep understanding of those cultures and the experiences of real people living there. For me, this gives a great insight into the impact of political systems and military regimes than a load of dates and statistics. Chimamanda Adichie is a Nigerian author who lives part time in the United States. She’s won numerous prizes for her work including the Commonwealth Writers prize 2005, the Orange Prize for fiction in 2007, The McArthur Genius Grant in 2008 and the PEN Pinter Prize this year. I wanted to feature her in the Girls Can Do Anything gallery of inspirational women because she is one of a growing number of voices from across the world that are contributing to a deeper understanding and appreciation of other lives and cultures. The 2012 Olympic Games marked a turning point for me in terms of disability awareness and the television campaign that marked the run up to the games was a major influence in the writing of Girls Can Do Anything. For the first time, the Paralympic games were given the airtime they deserved and the achievements of people with disabilities were publicly and noisily applauded across the nation. Here were people who were not made less by their disabilities, they were shown to be so much more. They were billed as superhumans who have accomplished phenomenal feats despite a whole host of obstacles including a wide range of disabilities. These people gave me courage and inspired me to keep going, at a time when I was facing my own difficulties. I could have chosen any of the amazing athletes to appear in the Girls Can Do Anything gallery of inspirational women, but I wanted to find someone who we perhaps hadn’t heard of yet. I wanted to find an ordinary hero who might help inspire us lesser mortals – someone to tell us that you don’t have to be the best in the world to be worthwhile. You just have to be the best you can be. Which brings me to Karen Gaffney. She’s the first person with Down’s syndrome to complete a relay swim of the English Channel – or La Manche if you’re on the other side. She is also the first person with Down’s syndrome to receive a doctorate, which was awarded to her by the University of Portland for her work in raising awareness of the abilities of people with her condition. She is one of an increasing number of people that are changing perceptions of people with Down’s and for that she truly deserves her place in our gallery. What do you want to be when you grow up? An astronaut of course! Yes, but you won’t ever become an astronaut. Or a professional footballer or a famous YouTuber or a film star or a pop star. At least, that’s what hundreds of children will hear from adults they trust. They will be told that their dreams are not for them. That they are not good enough to achieve those dreams. That these are things other people do. But if we tell them this, then we are crushing their ambition and robbing them of the drive that could actually propel them to become those things they dream of. Or, of becoming something else that they want to do more. Did you see that BBC series last summer, Astronauts: Do You Have What it Takes? It featured a group of people that went through the same training that NASA astronauts and the person who won it was supposed to be invited to apply to be a real astronaut. Well, it was won by a woman called Suzie Imber, a professor of planetary science at Leicester University. What I really liked about the series was that each contestant excelled at something different. And that the people you thought might not stand a chance, turned out to be some of the strongest. The point is, you could not predict who would win. Just as you cannot predict which children will achieve their dreams, whatever they may be. A few years ago, I discovered Helen Sharman, who was the first British astronaut and the first woman to visit the Mir space station in 1991. Her achievements preceded Tim Peake’s by 24 years yet hardly anyone has heard of her. But we’ve all heard of Yuri Gagarin and Neil Armstrong and Buzz Aldrin and Tim Peake. All great achievers. And all male Does that mean that there have been no women in space? Not at all! It’s just that we don’t really hear about them. You might be surprised to discover that the first female cosmonaut went into space 55 years ago in 1963. That’s just two years after Yuri Gagarin became the first human in space when he orbited the Earth in the spacecraft Vostok. So why does it matter that a woman went into space 55 years ago? She wasn’t the first person to do so. In fact, she was the 12th. Why does it matter that Helen Sharman went into space 24 years before Tim Peake? Well, it matters because it is proof to children that women can. Even though the number of female cosmonauts amounts to only 10% of the 561 people who have left this planet in a rocket, that’s still 60 women who have done it. And if other women have done it, it makes being an astronaut a possibility for every girl – and boy – who wants it enough. Girls Can Do Anything is about allowing our children to dream, and giving them the confidence that those dreams could come true. By showing them that these dreams belong as much to people born into female bodies as those born into male bodies, we are telling them that they are all valid and valuable human beings who have a positive contribution to make to the world. Let’s help our children achieve their dreams by letting them know that their dreams are achievable. 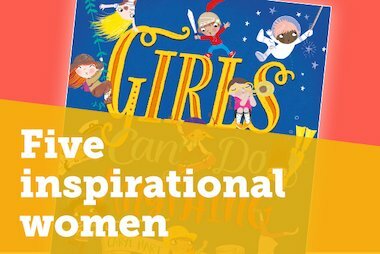 Girls Can Do Anything is a picture book for everyone with a dream. With Caryl’s heartwarming message of empowerment and award-winning illustrator Ali Pye’s vivid and beautiful illustrations, it is the perfect picture book to read with your little ones this summer. Check out some fantastic free activity sheets to accompany the book, and pre-order your copy here. Award-winning author Caryl Hart discusses the lives and achievements of another five women who have inspired her. 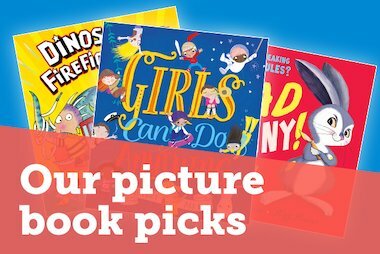 We have some fantastic picture books perfect for summer reading. Check out our current favourites! Award-winning author Caryl Hart discusses the lives and achievements of five women who have inspired her.